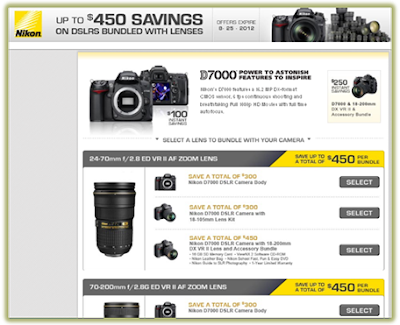 The B&H Nikon + lens bundle offer only has 4 days left. Buy a Nikon D7000 DSLR Camera with Nikon 18-200mm DX VR II Lens and Accessory Bundle and save $250 - add a Nikkor 24-70mm f/2.8G ED Autofocus Lens and save another $200! There are many more bundles available on Nikon cameras and lenses, so check them out now and grab yourself a bargain.